I picked this Nails Inc Brompton Place polish up last summer during a little trip to London. I was actually on a nail varnish ban, due to spending far too much money on nail polish, at the time I saw it so my lovely sister bought it for me instead. 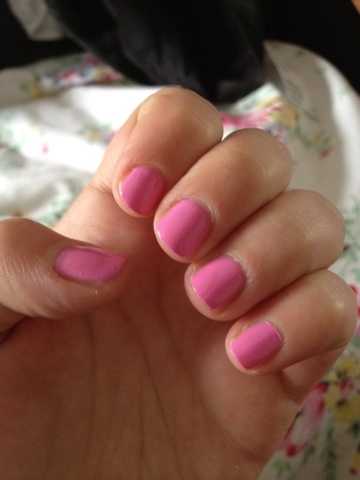 I really do love this colour, It's bright, girly and perfect for summer. It's got a very strong colour and really stands out, so it's definitely not a subtle look, but it looks great with a tan and can help dress up a plain outfit. It's easy to apply and gives pretty much full coverage after 2 coats, although I do tend to wear three coats of it just so it looks perfect. 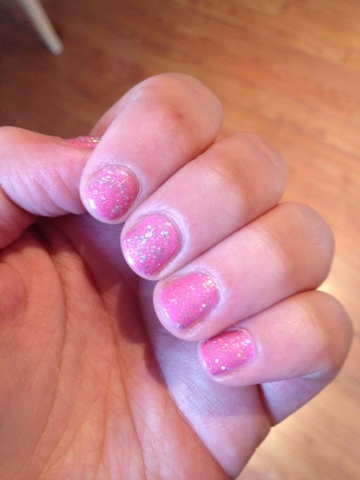 I also use this polish as the base for my OPI Katy Perry Teenage Dream Glitter and the 2 really complement each other. I think that's about all I can say about this polish, but I do love it, and if you're after a bright pink, I would definitely reccomend! I had a bit of a nail crisis this week, two of my nails broke so I had to cut them all quite short, so the pictures below are of my little stumpy nails, can't wait for them to grow back! I picked this up from a Nails Inc store for £11. What's your favourite pink polish? 2 comments on "Nails Inc Brompton Place Polish"